First Day of My Life: Happy Saturday! I'm going to the Ted Show with V today...can't wait! It's a little bit of a drive but will be totally worth it. It's sold out - 1,600 people! It's at one of the Performing Arts Centers at UF. have so much fun tomorrow and have a safe drive! Oh I absolutely LOVE your banner at the top! So cute! I can't quite remember how it all looked before as far as layout, but I think it looks great. Maybe add a fun summery background to go with the theme of your pics and font? Very CUTE, Cami! :) You've inspired me to really get on reworking my layout! I just need to make the time for it! 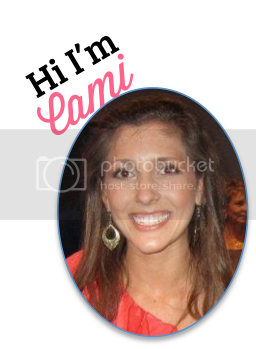 Oh Cami love the new layout!!!! Get an A+ from me. The old one was too dark for my poor eyes to read easily. The red print on the black was pretty but really hard for me. For us oldsters, thank you. I love the new layout!! I too love the banner at the top...great pictures!! I need to get more creative, my blog is so boring! Ha! Excited for what this week brings! I love reading your posts! Have an awesome week!! I love it, Cami!! It's very simple and sweet :) Your banner is great, what program did you use to make it?? I love the orange and pink, your signature, and the photo banner. I would recommend shrinking it so it fits within the parameter of the header so it doesn't look so cut off. I, personally, think you should leave the blog post section white and add a color to the outside of the layout so it isn't so stark. Like, maybe do the same orange on the outside edges just to frame it up a little bit. I can't wait to see what your "final" product is!